This recipe uses a vinaigrette based sauce with reduced chicken stock with lemon juice and fresh herbs. In a large bowl, whisk 3 tablespoons of the oil with the fish sauce, pepper, paprika and salt. Add the chicken piece by piece and coat evenly. Transfer to a large baking dish and marinate at room temperature for 1 hour, turning chicken over once to fully marinate both sides. In a saucepan, boil the chicken stock until reduced to 1/2 cup, about 45 minutes. Preheat oven to 425° F. In a large skillet heat the remaining 2 tablespoons oil to medium-high. Fry the chicken in batches until browned all over, about 5 minutes. Return the chicken to baking dish skin side up and bake on center rack for 25 to 30 minutes, until golden and cooked through. In a small saucepan, cook the butter over medium heat until golden brown, swirling it occasionally, about 5 minutes. As soon as it turns amber in color, remove from heat and strain into a bowl. (You may need to strain butter twice to remove brown bits.). Rewarm the stock over medium heat and add the browned butter, lemon juice and herbs. 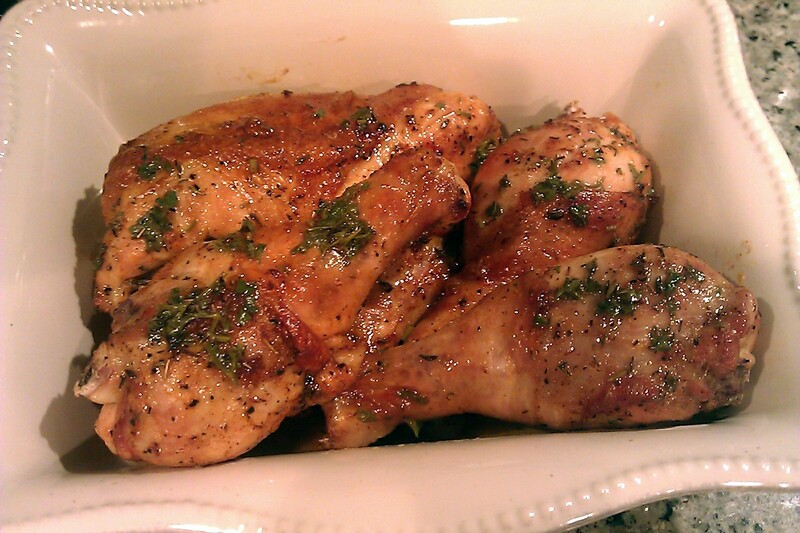 Transfer the chicken to plates and top with warmed vinaigrette. Season with more fresh parsley if desired and serve with lemon wedges. Your chicken dish looks and sounds great! That looks so moist & tender. I need to check out this Asian fish sauce – I keep hearing about it in different recipes but it’s not something I would have thought to try without a recommendation. It took me awhile to find. They do sell them in the Asian aisle of most major grocery stores. I always thought fish sauce was like a paste or thick but It is watery kind of like the vinegar you might find with fish and chips. It’s a wonderful recipe. I have cooked drumsticks twice in the past two weeks. All of the sudden my son can not get enough of them and keeps requesting them. I like your recipe and I think he would too. Thank you! It’s a simple, healthy, delicious recipe.